Monday I remembered to grab an army for when I swung by Red Castle Games after work. I broke out my Blood Angels, which I haven't played since early December and was actually able to get a game in. Played against Tyrannids. It was Dawn of War with 3 objectives. I played my OFCC list. What struck me though is most of his models had no upgrades. Tervigons were stock - to glands, sacs, or even catalyst...all of which would have helped tremendously. The objectives were placed roughly in the middle length-wise, with one on my left and the other 2 on the right. For deployment he put a tervigon on the middle-ish objective, and I put a Razorback with libby behind a rock on my left. He failed to steal initiative. I rolled on everything 6" to shoot the tervigon, except the devastators which come on next to the razor on the left. I failed all my searchlight rolls, but was able to knock off a couple wounds. DC blast up the middle. Everything walked on. 1 Trygon was right in the middle, then another trygon to it's right, then the deathstar, then the 3rd trygon. The tervigon and gaunts moved to the objective on my left. Tervigon that was already deployed spawned 10, but rolled doubles, then moved back. Everything ran as he had no shooting. Based on the way he came on, I came up with a plan. Dante fails to come on even with the re-roll. I shuffle all the tanks around, including going flat-out with the libby to the parking lot in order to shoot the tervigon. Shooting, the devastators take 3 wounds off the middle trygon, and I am able to get the tervigon down to just 1 wound. DC move to the objective on the left. One unit of ymgarls comes on and wrecks one razorback (passed pinning) and shakes another while removing the plasmaguns. Everything else moved up and ran. 2nd tervigon spawns 12. Dante comes in, drops on his board edge on my left. Tanks shuffle around again. Shooting the tervigon on the right dies, and ends up killing all remaining gaunts as a result. One Baal kills the ymgarls outright. The 3 meltas on the jump pack unit do 2 wounds to the tervigon. The wounded trygon that was in the middle dies. The DC jump out and assault a unit of spawned gaunts, wiping them out. Everything moves up again. The Doom drops in, but scatters away enough that nothing is within 6" so it runs. The ymgarls move on, killing the 5 guys from the wrecked razorback. They also assault the libby's razor, but it had moved 12" and they completely failed to damage it. The remaining tervigon spawns 12 more without doubles. It then assaults the death company, I get 2 wounds in and he kills 2. The 32 gaunts shoot and assault the jump pack guys, I lose 2 to shooting but none in assault, resulting in most of them dead from damage + no retreat. Dante's unit hits and runs out of combat. Dante splits off to assist the DC. The other jump pack guys get ready to assault either the gaunts or Doom. My tanks then start moving to my left, getting away from all the nasties. Doom goes off, killing a DC, but the other 2 units make the LD tests! Shooting wipes out the 2nd unit of ymgarls, does a couple wounds to the 2nd trygon (which is the only other thing that is a threat to the left objective). I shoot a bunch of S8 stuff at doom, but he passes all the saves (which is a theme for the rest of the game). Assault phase I move in against the doom, but can't kill it ..he makes a ton of saves and nothing on my side dies. Dante and DC brings the tervigon down to 1 wound, and stay locked in combat. Stuff moves up and runs. The trygon blows up a Baal Pred. The trygon spawns 11 more gaunts and he uses them to block the objective. The doom kills an assault marine and the last 2 DC, but does nothing in the assault phase again. Dante finishes off the last wound on the trygon and does some damage to the gaunt units but they all stick around due to synapse from Doom. Again, a bunch of saves on the Doom keeps the combat going. I continue to shuffle the tanks to the left. The libby and assault marines move out and kill off the gaunt unit on the objective. Dante finishes off the biggest of the other gaunt units, and shooting kills another. That leaves 2 gaunts remaining that have gone to ground. The doom kills 2 assault marines, and in the assault phase is able to kill the priest (thanks to being S9 so no FNP). Missiles kill the pod for lack of anything else to do. The wounded trygon moves to my left, hoping to get over there in time to do some damage. The doom's combat continues, I pass my LD and I'm able to do just 1 wound to it. We roll for a turn 6. All my tanks move up and block the objective from the trygon. Dante has just 1 wound remaining, all from the doom's power and failed invul saves so he kinda stays away. The libby's unit gets back in the razor and sit on the objective. The assault continues with the doom. The trygon moves up and blows up the 2nd Baal. The doom kills another marine but finally falls to the power fist! Roll for turn 7 comes up a 3, giving a 1-0 objective win to the Blood Angels! I knew I cold not handle his list in combat, too many MC's, he had just too much and I don't have the bodies to deal with the number of wounds I'd suffer. Being able to isolate the much weaker troops units and concentrate on them for shooting and assault was the key here. I played the mission instead of trying to go toe-to-toe with an obviously superior combat force, and the result was a solid victory. For some reason the store owner wanted to bump the league to 2500pts. Just for fun, I decided to bring out my Tau army again. Farsight, of course. I finally got to play against the new necrons and oh boy what a great game. The Shas'el goes with the broadsides. I found this little gem on the 11th company, and love it. Not only does it give the unit 2 more shield drones, but also LD9. Plus he can still fire at a 3rd target. Still not convinced on the piranha. I don't like them, and I remember why. They don't do anything. If I want sacrificial fusion guns I'll use XV8's. But so many points sucked into something that is only there for tricks?Does not seem worth it to me. I'd rather have a 2nd unit of pathfinders. But here is where I went wrong. I was sure the wraiths had warschythes! I don't know where I got that idea, but that was my downfall. I poured all my fire into them, not wanting them to touch Farsight. But once I realized that there where no such item, it was too late. I can attest how they would have done when they were fighting my broadsides. I should have ran the wraiths over with the bodyguard and poured all my fire into the scarabs. I would not have killed them, but I would have greatly reduced the number (since every shot would have been a whole base) and that would have made the difference. Live and learn! Not sure if I will stick with Tau for the whole month. I'd like to play my other armies at 2500 as well. The 2800pt army has to be done by June 23rd. So much work to do! But at least I'll be able to get some games in real soon. Probably on the 12th will be my first full 2800pt game. Magnets on the way as well. I love the K&J Magnetics surplus section. 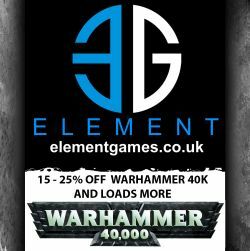 Great deals for random sizes which is perfect for basing.